Cocktailians: Gin & Titonics, Anyone? In the same vein as the perfectly spherical ice cubes heretofore mentioned, Fred has created a series of ice cube trays in the shape of everyone's favorite maritime disaster. 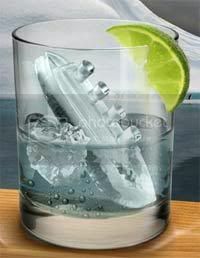 These Titanic-shaped ice cubes won't sink, but they will make you & your guests feel like the kings of the world. And they seem small enough that you'll be able to enjoy them until well after the band's playing "Nearer My God To Thee." A "Titonic" should be something entirely different.